Cabinet approves merger of Dena and Vijaya Bank with Bank of Baroda. Union Cabinet chaired by Prime Minister Shri Narendra Modi has approved the scheme of amalgamation for amalgamating Bank of Baroda, Vijaya Bank and Dena Bank, with Bank of Baroda as the transferee bank and Vijaya Bank and Dena Bank as transferor banks. 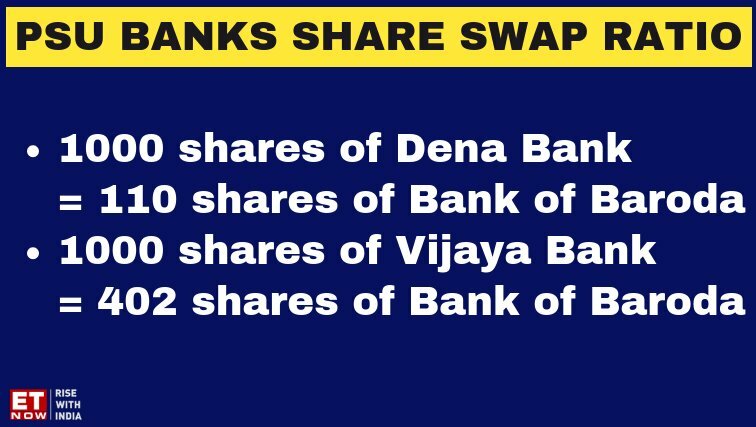 In pattern of shares gains of two merging in BOB, shareholders of #VijayaBank will get 402 #equity shares of #BankofBaroda (#BoB) for every 1,000 shares held and #DenaBank shareholders will get 110 shares for every 1,000 shares of BoB.